These laser-cut simulated Cedar Shake Shingles come two (2) sheets to a package. If you select the adhesive backing, the strips are permanent self-adhesive - just peel and stick. Each shake is a slightly different length to model variation of real shake shingles. With a light painting of alcohol/India ink solution, the shingles take on a nice aged appearance - use a bit more, get more aging - it's up to you. Check the product photo - half is stained, half is not. There is also a strip that can be used for a ridge cap. NOTE: The package contains sheets of laser-cut strips of shingles that need to be layered up - just like real shingles. These are not pre-layered sheets. Shingles are laser-cut from a heavy wood fiber content paper and resemble wood or asphalt shingles very well. Each package contains two (2) sheets that measure 4" wide by 12" long - approximately 90 square inches of material. With a 50% overlap, the two (2) sheets cover approximately 45 square inches of roofing area. 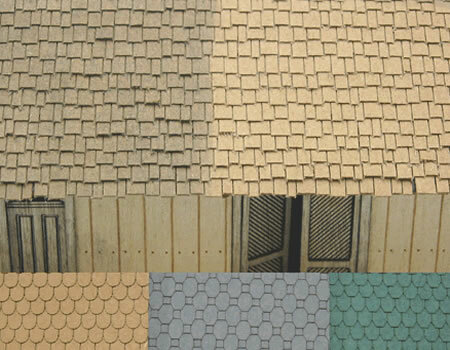 These Shakes Shingles can also be used for wall coverings to vary your buildings. They can be stained easily, and you can add various tones to simulate rotting or even previously painted shingles. Updated color chips; we've added some new colors for you to choose from ! Be sure to also purchase the D5516 O Scale Ridge Caps and Starter Strips Sheet to start off and finish your shingle installation in the same color as your shingles.